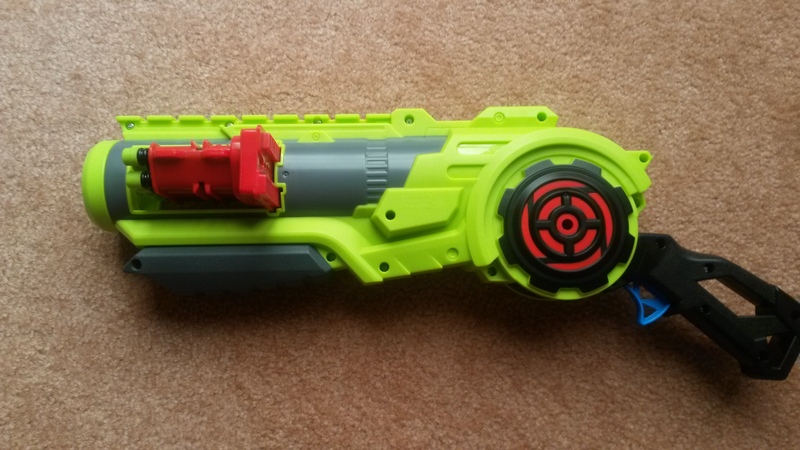 A surprisingly effective blaster that's heaps of fun. All the stuff from the Breakflip box. 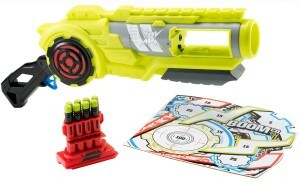 The Breakflip is one of the newer BoomCo blasters, released well after the original batch and sporting a distinct and unique colour scheme. 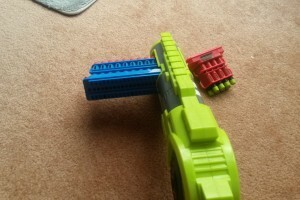 More importantly, it promises a continuation of BoomCo’s clip system with a flick-prime capable blaster. 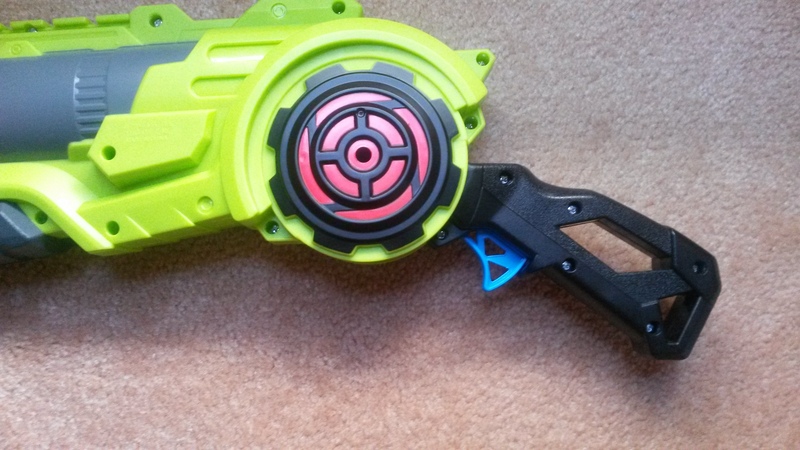 How does the Breakflip compare to Nerf’s clip (mag) system blasters? 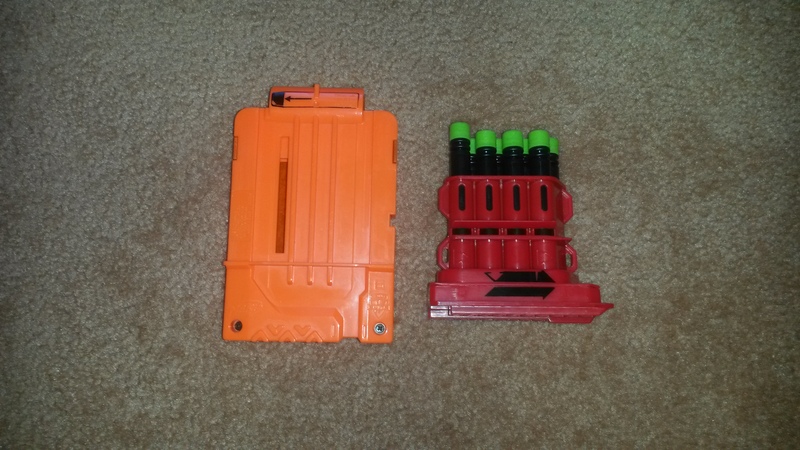 8 dart clip next to Nerf's 6 dart clip (mag). Top of the two clips. 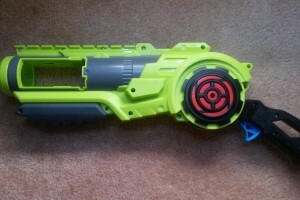 Taking a quick look at the included 8 dart clip, note how compact it is, especially compared to Nerf’s 6 dart clip (mag). 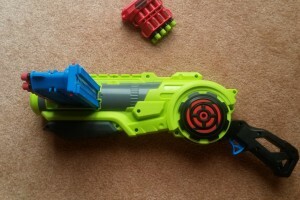 This compactness is one of BoomCo’s major advantages over Nerf, and is all thanks to its unique dart type. Right side of the Breakflip. 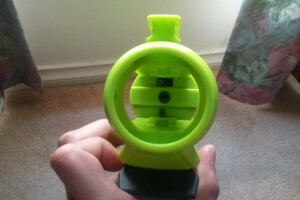 Tac rail on the top. 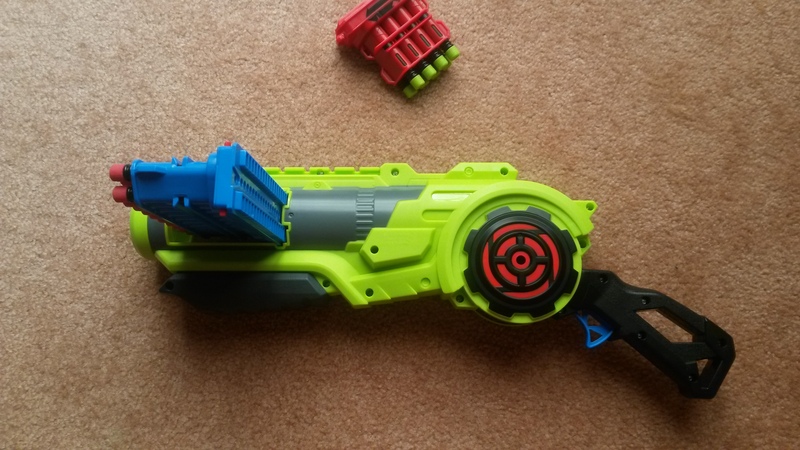 The Breakflip is an interesting blaster. 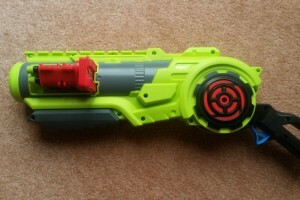 It appears to me to be a cross between a sawn-off shotgun and a laser cannon, with the cylinder for the pivoting handle resembling an energy core. The stock Breakflip picture appeared to show it with a very light, almost yellowish, fluoro green, but in person it is much greener, which I personally prefer. I honestly quite like the overall design and the colour scheme. My left hand on the fore end. Close up of the offending area. 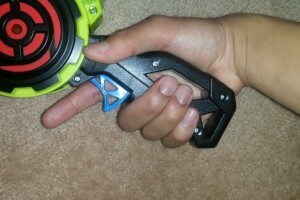 As part of the shotgun style design, the Breakflip has a fore-end grip despite not being pump action. It’s a reasonably comfortable piece, though not particularly big. 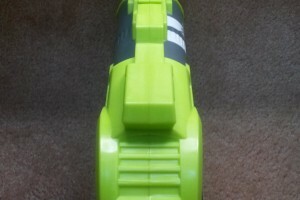 The handle is much the same as most BoomCo handles (ignoring the obvious angle difference), but has one issue. The front edge is significantly sharper than it should be, which becomes particularly noticeable and painful after repeated flick-priming. 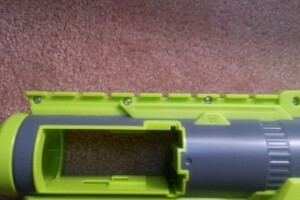 Unlike some Nerf designs, the holes in the handle don’t present any issue. 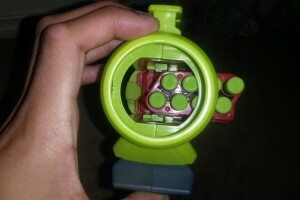 Down the muzzle with the clip loaded. 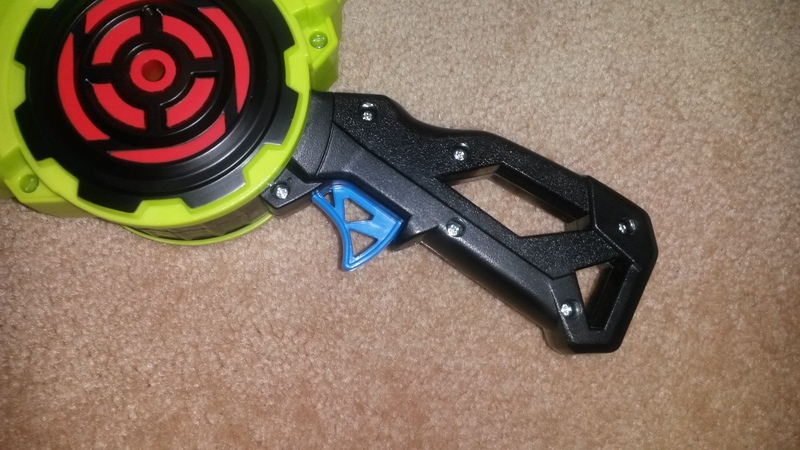 The Breakflip accepts clips into the front. 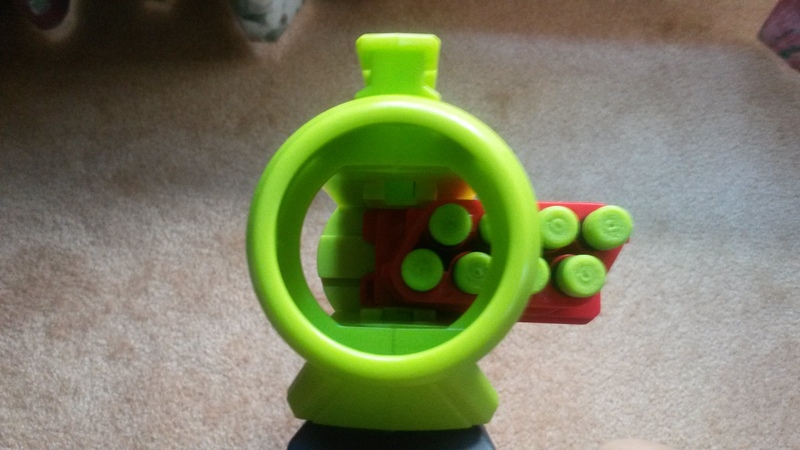 Looking down the muzzle, you can see the various functional parts within the clipwell. The top piece advances the clip, the middle piece is the plunger outlet, and the bottom piece applies friction to keep the clip from slipping. 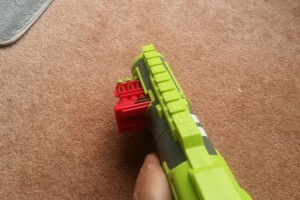 A hidden piece at the bottom prevents firing if no clip is loaded. Clip loading is simple, just shove a clip in the correct way until it clicks. 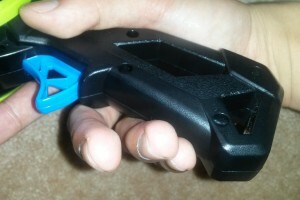 In the case of the included 8 dart clip, push it in until two seperate clicks are heard – the clip will be in the position pictured. 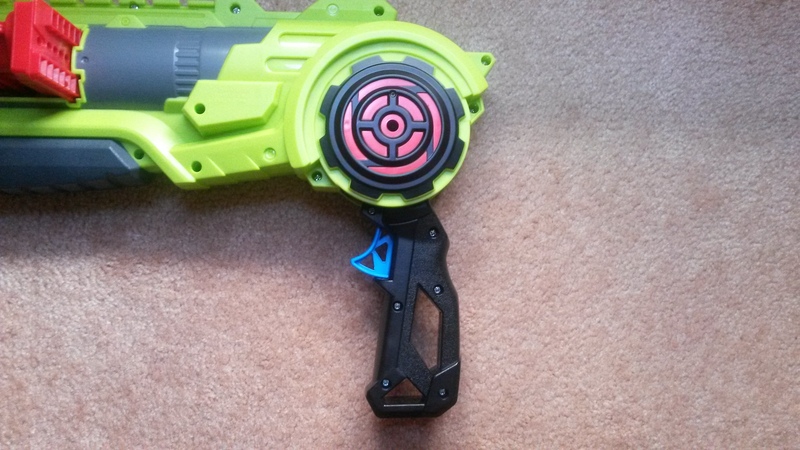 Interestingly my old 20 dart clip from my Rapid Madness only clicks once when being pushed into the same position. First dart in firing position. The Breakflip priming cycle is very basic, simply pull the handle down to a roughly right angle, then return it back up. The downwards action will prime the spring, while the upwards action will advance the clip. 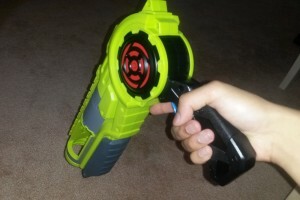 The Breakflip also has slam-fire, in the sense that holding the trigger down and repeatedly priming will repeatedly fire without issue. This feature is not featured in the instructions, and rather is likely a side effect of the internal design. 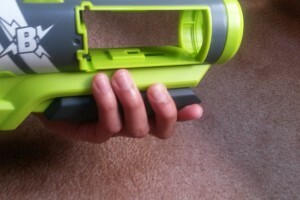 Note that once the blaster is primed, the handle is not locked in place, unlike Nerf blasters. 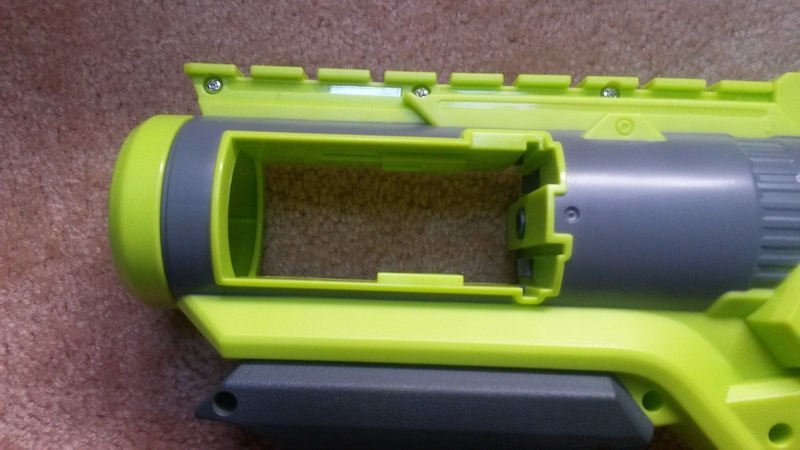 This allows the clip to be repeatedly advanced via priming without firing, if for whatever reason you want/need to skip some chambers. This does lead to an issue, which I’ll elaborate on in a moment. There are two distinct priming methods for the Breakflip. 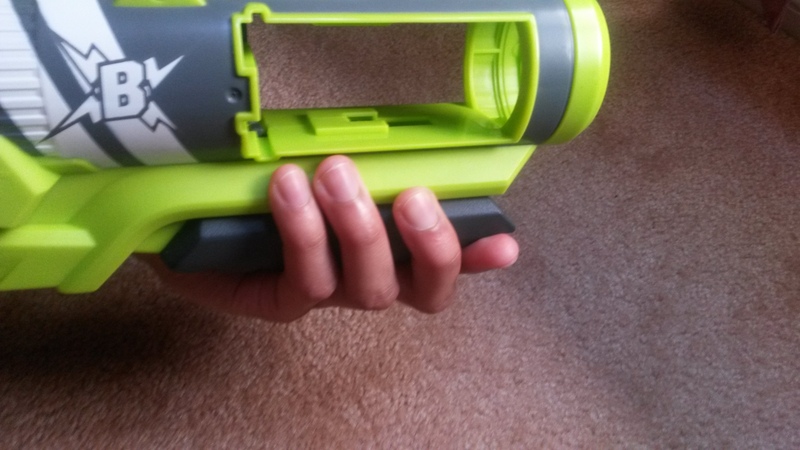 The first is a two-handed grip featured in the instructions, not dissimilar to breaking open a double barrel shotgun. This grip is simple, effective, highly reliable and quite fast. 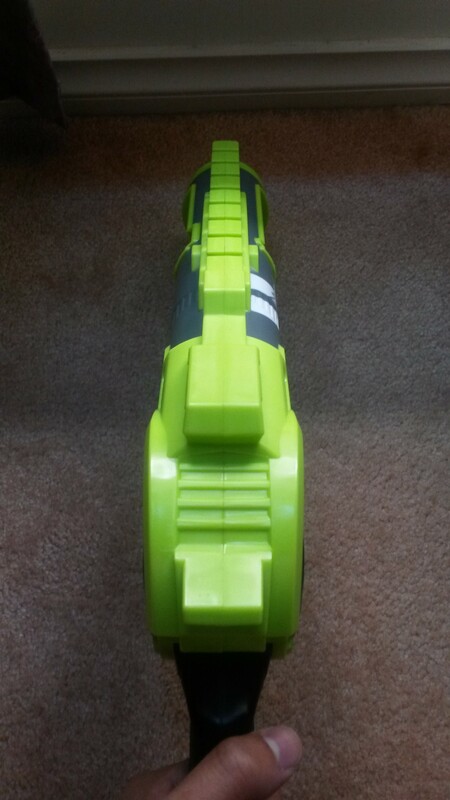 It’s almost as fast as a regular pump action, though not quite as stable. The second far more fun and exciting priming method is a one-handed flick-prime. 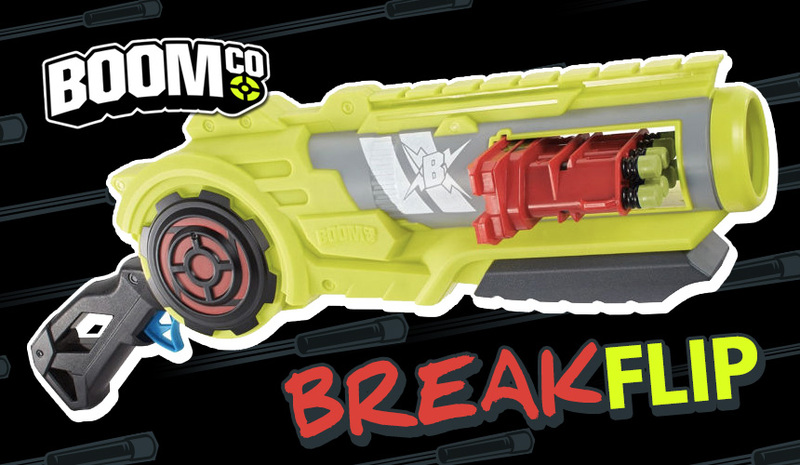 By design, the Breakflip is very effective at flick-priming, certainly far more effective and far easier than flick-priming a Slingfire. There is one issue with flick-priming however, which is a result of the lack of a handle lock. When flick-priming, the Breakflip has a tendency to flip itself back down after the flick-prime action. 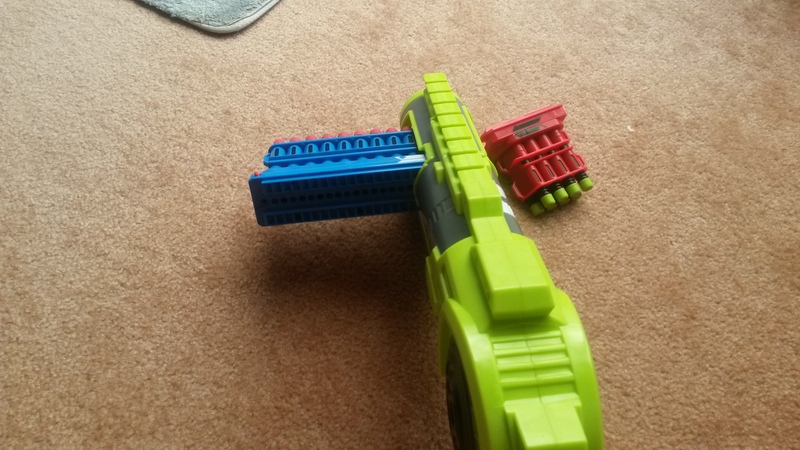 This appears to be caused when the body of the blaster comes to a sudden stop at the end of the flick-prime, causing it to bounce back down. This is avoidable by developing a proper technique, which will likely come to you after some use. 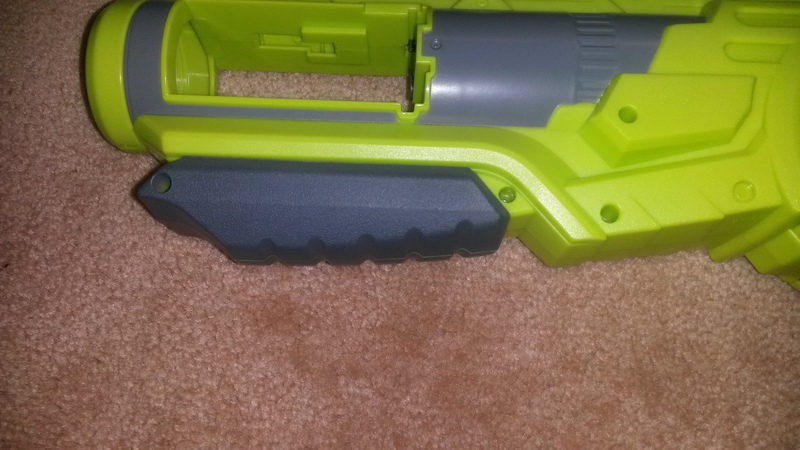 8 dart clip loaded, side on. 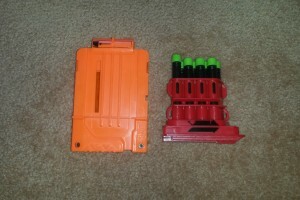 8 dart clip loaded, top down. 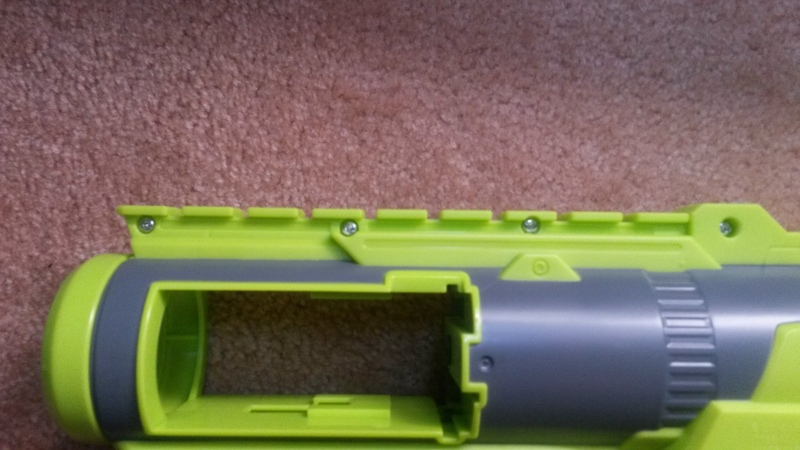 20 dart clip loaded, side on. 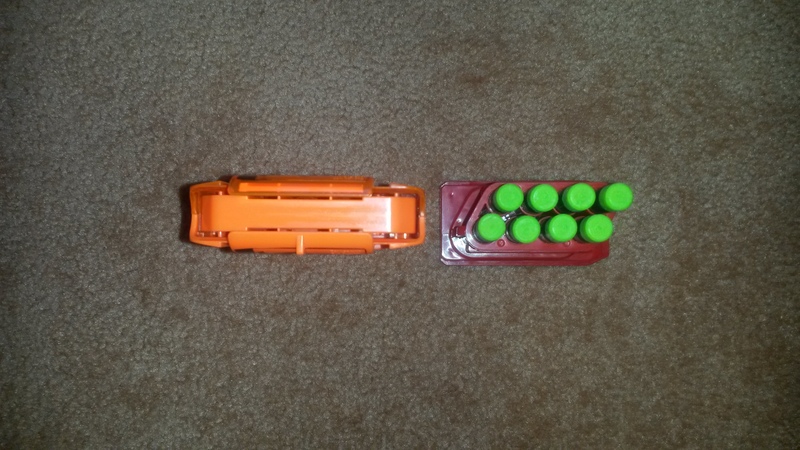 20 dart clip loaded, top down. Much of the Breakflip’s appeal comes from its flick priming, which works best when the front weight and the friction of the pivoting handle are balanced well. 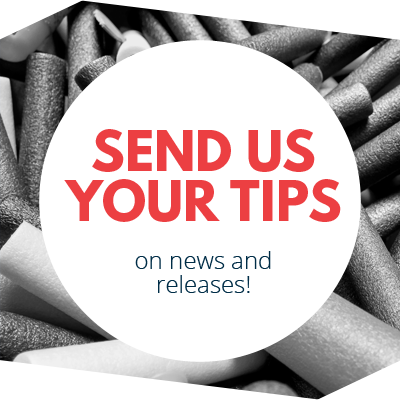 The included 8 dart clip works well with the Breakflip, adding minimal width and weight. The weight of the clip is largely negligible, and so flick-priming with the 8 dart clip works fine. 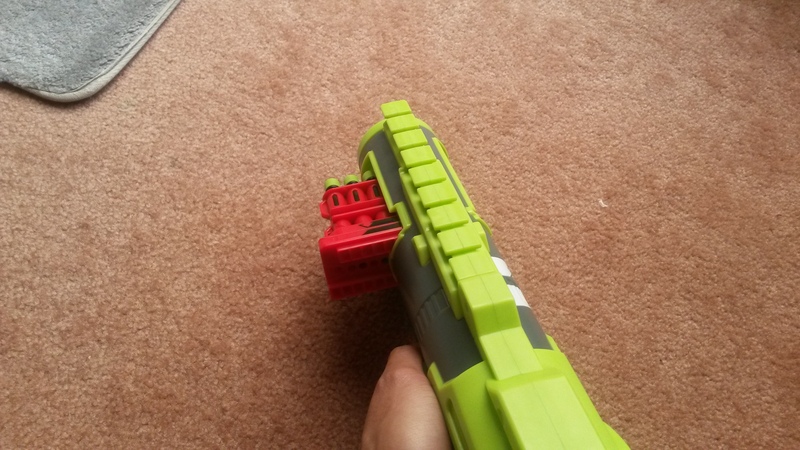 Switching to a 20 dart clip is practically speaking a good idea, however presents a few usability issues. 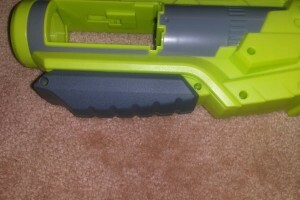 Firstly is the obvious width of the clip, however compared to side magwell Nerf blasters such as the Stormtrooper Deluxe Blaster, the width of a 20 dart BoomCo clip is not that big a deal. More importantly however, is the additional weight. 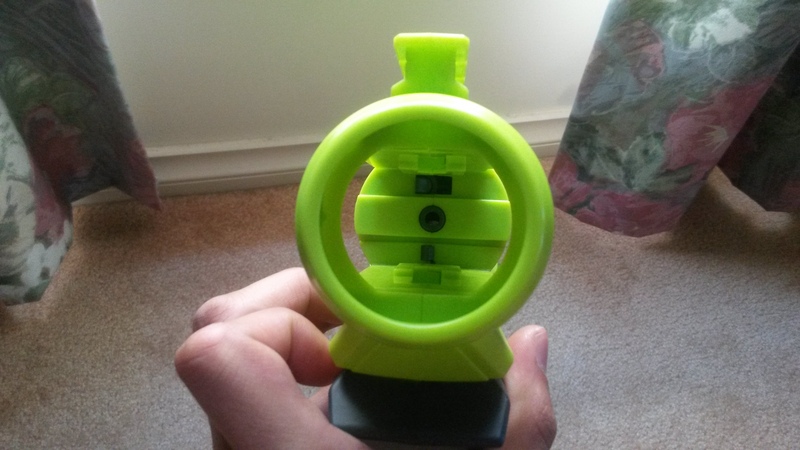 The extra weight of the 20 dart clip is immediately noticeable, and causes issues in flick priming. Without well practiced technique, flick priming will often cause the Breakflip to flip itself back down. 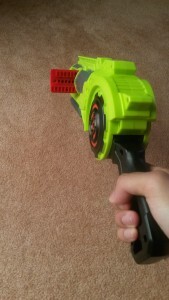 Though this issue is already present without the 20 dart clip, the presence of the 20 dart clip and its weight greatly increase the chance of it happening. 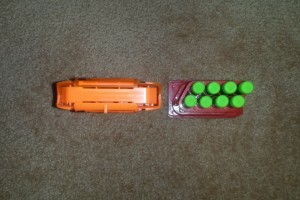 Proper technique can still prevent it from occuring, but it is significantly harder to control compared to using an 8 dart clip. 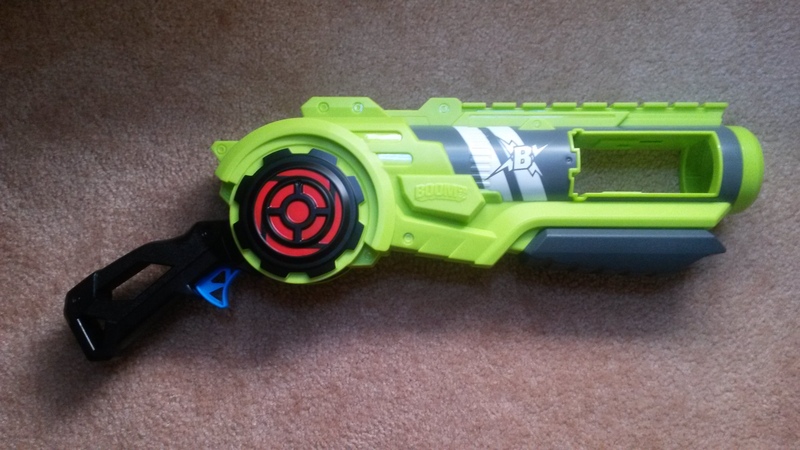 Breakflip next to a Stryfe and Stormtrooper Deluxe Blaster. 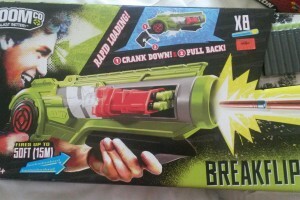 The Breakflip is not that big a blaster. While I was worried at first that it would be quite bulky (thus making it a pain to pack into luggage), it is on the whole quite well sized. 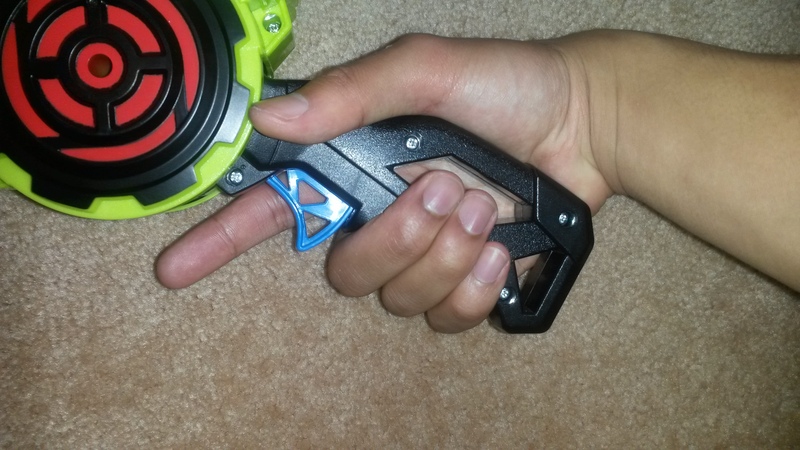 I’d estimate it to be very similar to a Roughcut, though I haven’t had a Roughcut for a while. Note that my model has a range claim of 15m. Range is unimpressive at about 9-10m very consistently. 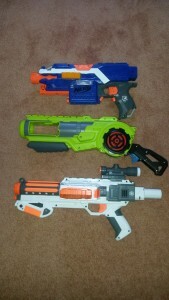 About the same as the other BoomCo blasters I’ve tested. 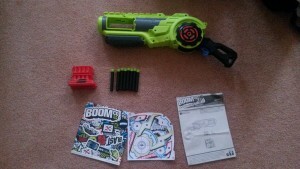 Accuracy is, as expected for a BoomCo product, impressively good. At full range in the range test, I was getting a spread of about 20cm in diameter, which by Nerf standards is ridiculously good. 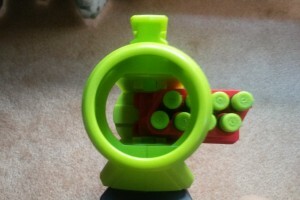 Hitting a human sized target at full range is pretty much guaranteed, and hitting smaller targets such as soft drink cans can be done with a bit of practice. 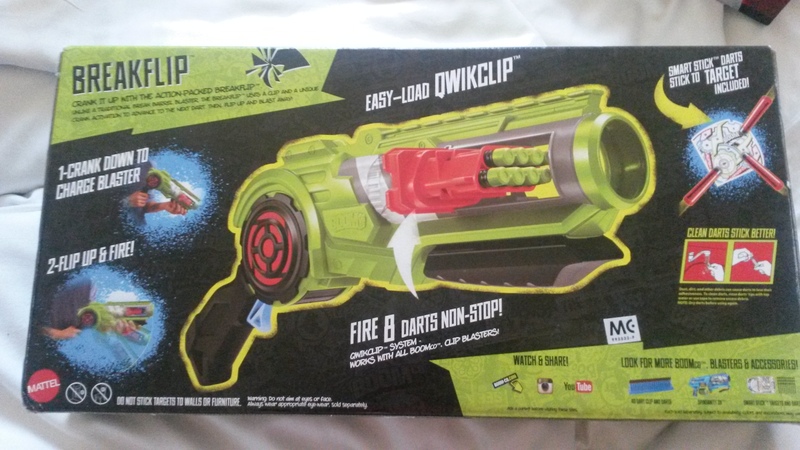 Rate of fire is a bit of a surprise. 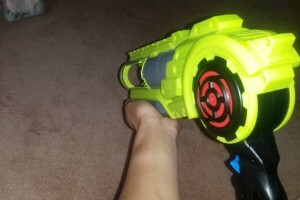 The Breakflip has slam-fire (hold the trigger down and repeatedly prime to repeatedly fire), which doesn’t suit a blaster of this style as the technique required for highest ROF is utterly impractical. Regardless it is possible to achieve about 4 darts per second with a two handed grip. 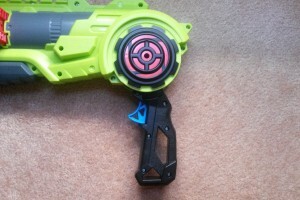 A one handed flick prime can get just under 2 darts per second depending on which clip is used. 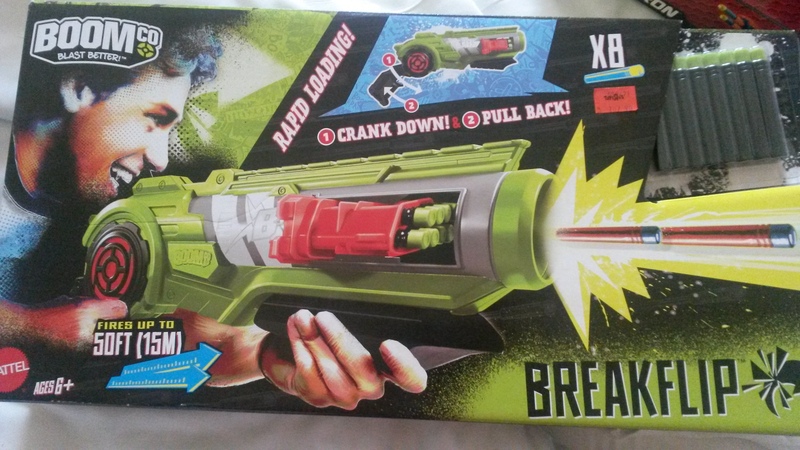 The Breakflip is a reasonably solid all round blaster. 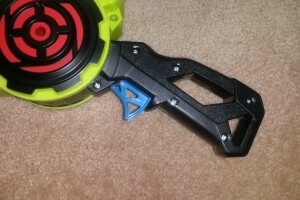 Though it doesn’t quite have the stable ROF to contend with pump actions like EATs for rapid fire (though the two-handed technique does get close), the Breakflip’s exceptional accuracy is a major advantage over most foam dart blasters. 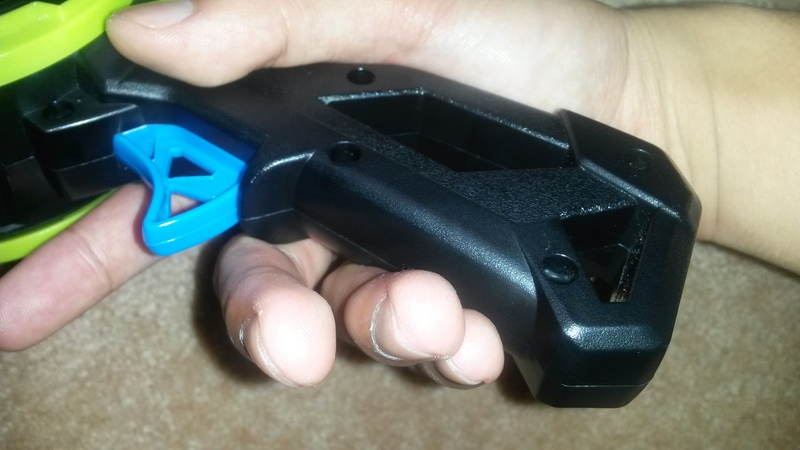 The one-handability is a significant feature that offers a good amount of versatility, especially with the exposed clips allowing for reloading on-the-fly. Perhaps the biggest disadvantage the Breakflip has is a slight range deficit, but that can be covered up with good movement and use of cover. 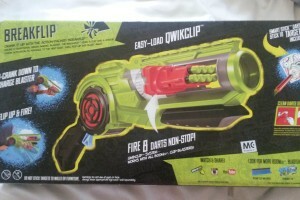 Overall I think that with some spare clips and flick-priming practice, the Breakflip can be a very effective blaster. I purchased my Breakflip in Malaysia for 108RM (36AUD or 25USD at the time), which by Malaysian standards is actually quite cheap. 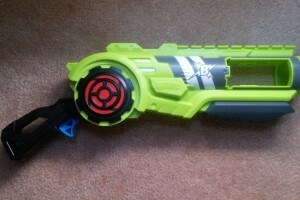 The Strongarm for instance is ~70RM (23.3AUD or 16.3USD), while a Cycloneshock is ~100RM (33.33AUD or 23.33USD). 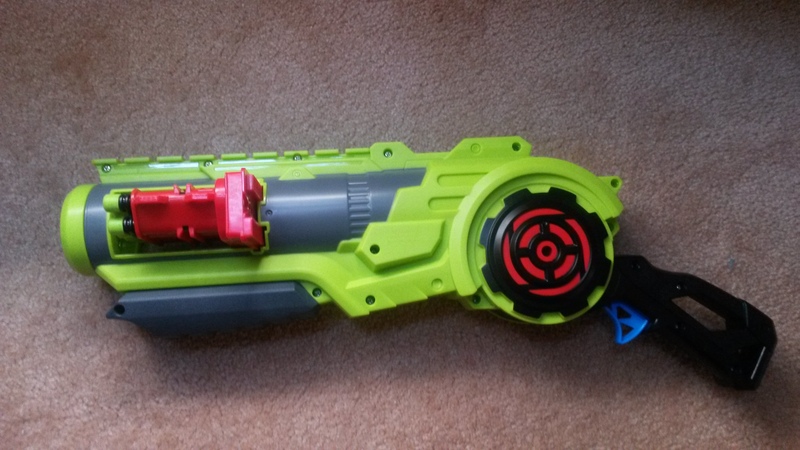 Even a Buzz Bee Blastzooka is ~87RM (29AUD or 20.30USD). 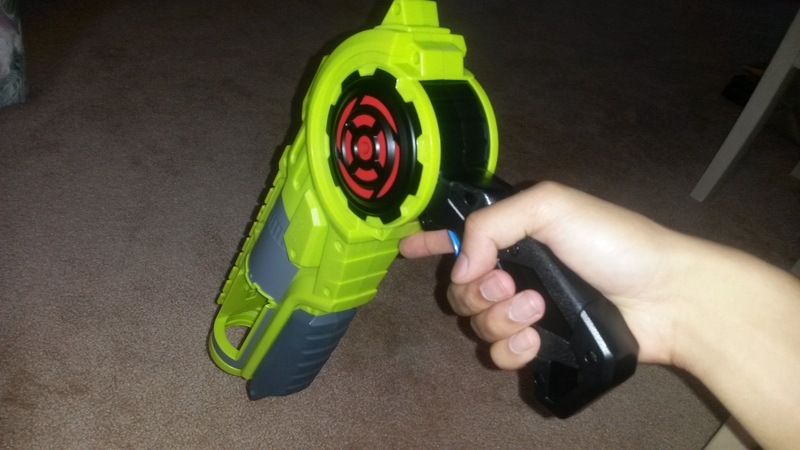 While the Breakflip is not the most practical blaster out there, and it does have a few ergonomic and usability issues, it’s a lot of fun to use and with practice, can be quite effective. I’d certainly recommend giving it a look. Unfortunately very minimal. 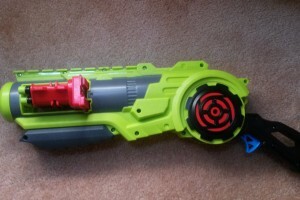 Though BoomCo mods in general are severely under-documented, not a whole lot appears to be doable or effective for the Breakflip. Its spring is very difficult to swap, and there are few other parts that are worth altering/removing. 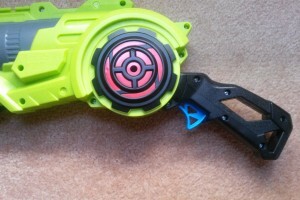 The most effective mod is actually one that has nothing to do with the Breakflip, instead altering the clip itself. 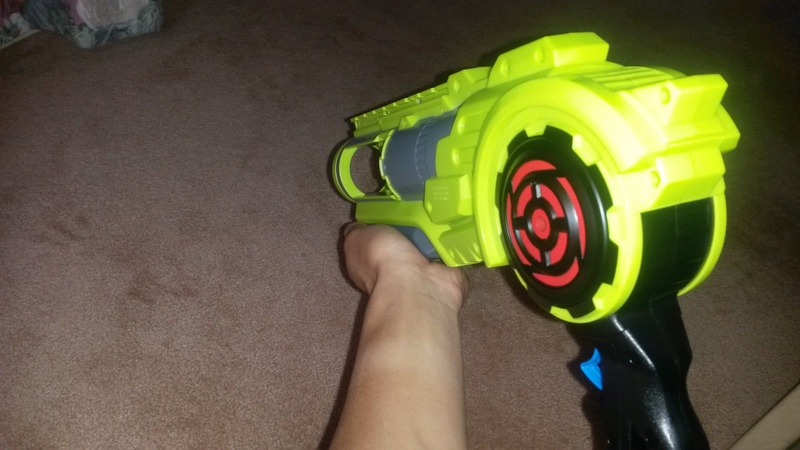 This mod is known as the “sniper clip” mod. 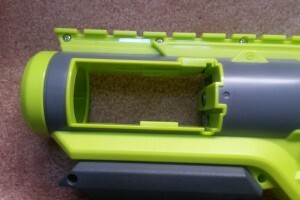 Filling in all of the unwanted vent holes in the clip can provide a substantial performance boost depending on the blaster. The above link also has links to a lot of data comparing stock clips with these “sniper clips”. 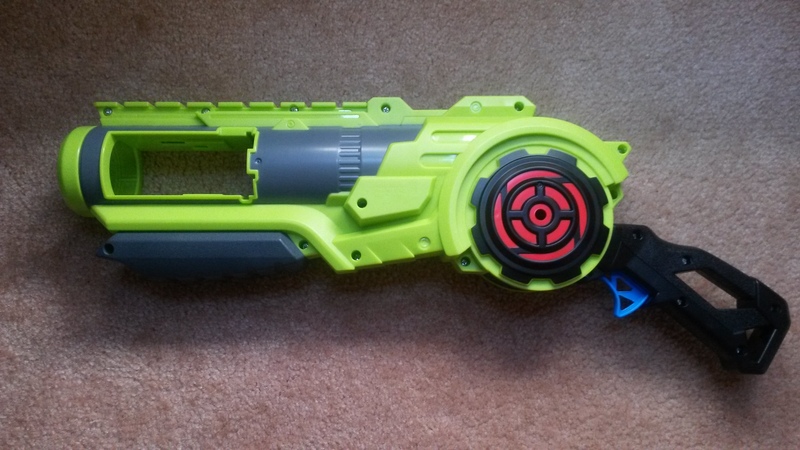 Though the velocities and ranges are significantly below what I would consider “standard” modded Elite blasters (spring swaps, overvolted flywheelers), the incredible accuracy remains as the Breakflip’s big advantage, and that alone keeps it viable and usable. This entry was posted in Dart Blasters, Reviews and tagged boomco, breakflip, review on February 7, 2016 by Outback Nerf. 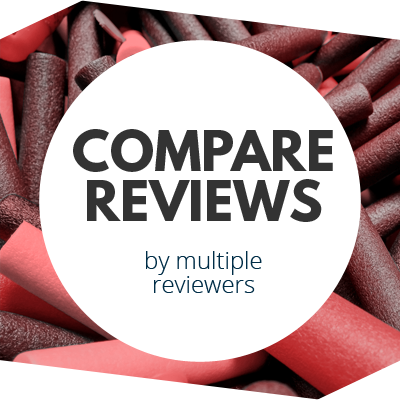 When colossal blitz or atlas review?